Philippine Copyright 1979 by the Far East Broadcasting Company Philippines.Papuri is the music arm of the Far East Broadcasting Company Philippines. Digitally re-mastered and distributed in the Philippines by Praise Incorporated. All rights reserved.Made In The Philippines. Filipino Artistic Expression+Christian Faith+KBP Requirement+ musically gifted individuals=Papuri! Papuri was named after medidating Ephesians 1st chapter by Mr.Efren Pallorina, Papuri is the tagalog word for Praise. Mr. Pallorina also developed a concept of three C’s to put the project together as a bundle,consisting of Cassette,Chordbook,Concert. Over the years, the original three C’s of Papuri!- cassette,chordbook, concert-have expanded to include another C, church promotions, whose purpose is to introduce and encourage the use of Original Pilipino Music in their worship, fellowship and evangelism program. 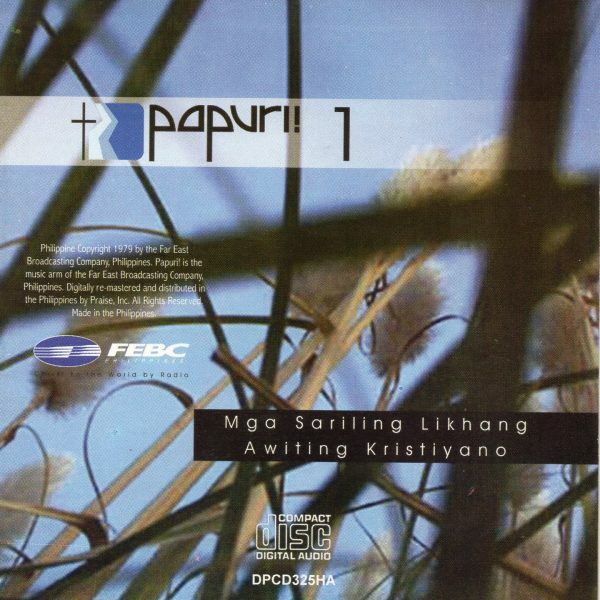 Recorded and Mixed at the Music Recording Studio of the Far East Broadcasting Company.Digitally re-mastered and distributed in the Philippines by Praise Inc.